The Chestnut Knob Fire started on Sunday November 6, 2016 at 8:00 am in South Mountain State park 10 miles south of Morganton, NC. The Party Rock Fire began on Saturday November 5, 2016 adjacent to Chimney Rock State Park. 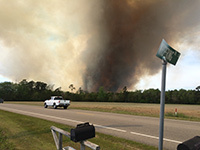 The Clemmons Road Fire started at 1:45 p.m. on April 19, 2016 in the Bolivia community of Brunswick County. The Whipping Creek Road Fire began on the afternoon of April 18, 2016 near the Hyde and Dare County line. It began on private land but quickly moved onto the Alligator River National Wildlife Refuge and US Air Force's Dare Bombing Range. The Weed Lane Fire broke out near the community of Ridgecrest on the afternoon of March 31, 2015. This blaze was reported on November 25, 2012 in Calwell County. It burned in steep, rugged terrain in a forested area off of Highway 321 between Blowing Rock and Lenoir. 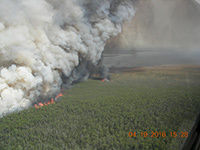 Begun by a lightning strike on May 5, 2011 in the Alligater River National Wildlife Refuge in Dare County, this fire eventually encompassed over 45,000 acres and affected part of the US Navy Dare Bombing Range. The blaze was jointly managed by the US Fish and Wildlife Service and the NC Forest Service. This fire broke out at the Marine Corps base, Camp Lejeune in March, 2011. It quickly grew to 9,566 acres in size, which included 908 acres on state land. The fire was declared contained on March 29, 2011. Breaking out on February 12, 2011, this blaze in steep, rocky terrain in Polk County burned 1,477 acres before it was declared controlled on February 21. The Lumber Plant Fire burned 737 acres in Surry County between February 14 and February 20, 2011. At one point, 50 residences were threatened by the blaze.